BEVERLY — Being green ain‘t easy. Just ask the ogre at the center of the action in “Shrek The Musical” at the North Shore Music Theatre through July 19. He’s forced to leave his home at the age of 7 to live alone in a rancid swamp. NSMT owner Bill Hanney told theater-goers before a recent performance that if they had come for an evening of serious, educational theater, they had come to the wrong place. “Shrek The Musical” is the legitimate theatrical child of the fabulously successful animated “Shrek” movie series, which featured the voice talents of Mike Myers as Shrek and Eddie Murphy as The Donkey, along with other star voices, including the late Joan Rivers. The musical was nominated for eight Tony Awards on Broadway. While kids could enjoy the movies, the adults usually had just as much fun if not more in the one-liners and cultural references sprinkled throughout. The best thing about this “Shrek” is the book by South Boston native David Lindsay-Abaire , who also contributed the clever lyrics to the score by Tony Award winner Jeanine Tesori. The show is witty and engaging without getting too schmaltzy as it tells the story of a lonely ogre who finds a friend and true love in an most unlikely manner. Both Shrek and Princess Fiona, the heroine, had what you might consider tough childhoods. Shrek’s parents exiled him from the family at the age of 7, telling him it‘s “Big Bright Beautiful World” for everyone — except him. Lucas Proost brings the required ogre bombast to the character as well as the softening around the edges as he realizes he is capable of loving someone and being loved. Princess Fiona (Lauren Wiley), meanwhile, is exiled to a tower by her parents as a child, awaiting the kiss from the true love who will rescue her and free her from her prison. 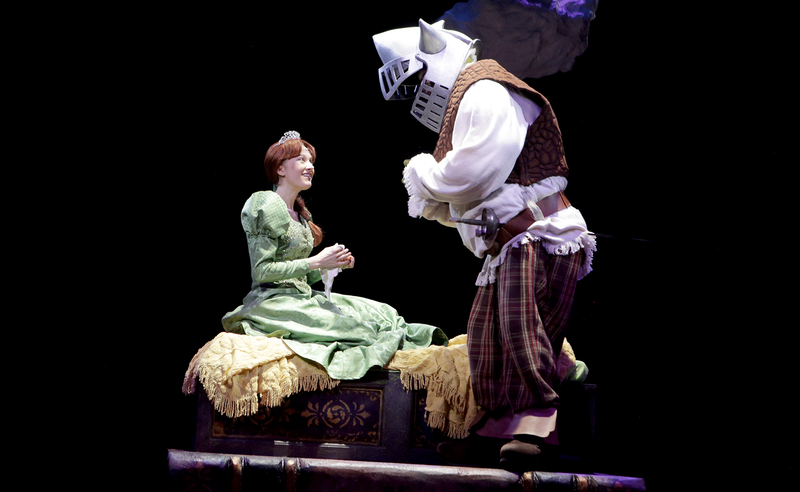 She is relentlessly spunky and upbeat, even when confronted with Shrek, who is not exactly the man of her dreams. Benjamin Howes provides a splendid turn of physical comedy as the vertically-challenged Lord Farquaad, a role Howes appears to perform entirely on his knees. Farquaard agrees to hand over to Shrek the deed to his swamp if he will slay The Dragon (Jaqueline B. Arnold) that guards the tower, rescue the princess and return her to Duloc. An adventure of this kind requires a sidekick. Enter Donkey (Dwane Clark). And he is a splendid, funny sidekick as the friend who latches onto Shrek as the two form an unlikely — if effective — duo. “Shrek” is also a mash-up of popular fairy tales. The best of the best is Pinocchio (Will Porter), who emerges as the leader of the castaway fairy tale characters exiled to Shrek’s swamp. Porter has graduated from NSMT audience member, the Commonwealth Ballet and the Concord Youth Theatre to the NSMT stage. 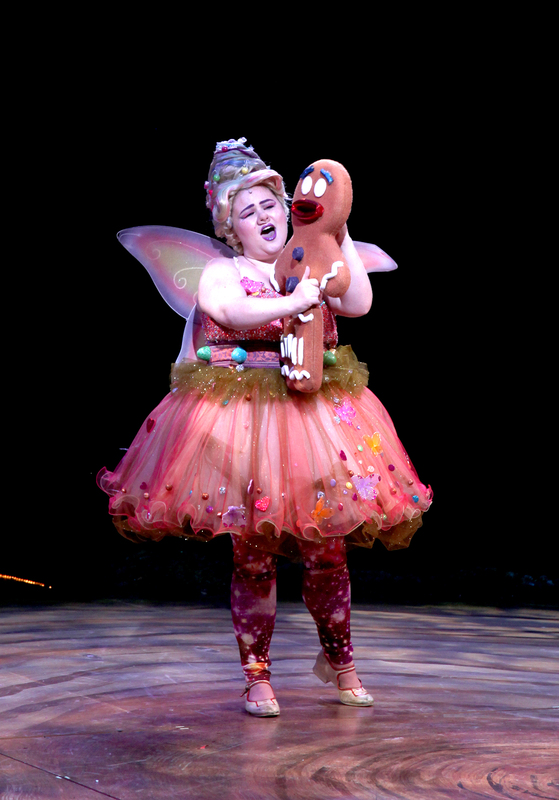 Kathy Geraghy is a hoot as Sugar Plum Fairy and Gingy, the gingerbread man who is held captive and tormented by the wicked Farquaard. The kids are allright in this show; kudos to the young but very professional Haven Pereira (Young Fiona) and Harrison Sturgeon (Young Shrek). Just when you think the kids might be getting bored with the love story and life lessons, it’s time to reengage your inner 10-year-old with the farting and burping contest between Shrek and Fiona. Hey, it was in the movie, too. Michael A. King’s makeup brings the green hero to life and Sam Brooks and Jamie Bressler designed the boffo dragon costume for Arnold, who can really belt out a tune for such a large lizard. Director Michael Kreitzman helmed one of then best Boston-area musicals of 2015 — NSMT’s “The Little Mermaid” — and he again shows a deft touch with both the material and the in-the-round format. “Shrek” is a witty delight, and it has as much to offer the older kids — that means you, grandparents and parents — as it does your kids. The North Shore Music Theatre production of “Shrek The Musical.” Book and lyrics by David Lindsay-Abaire, music by Jeanine Tesori. Directed by Michael Keritzman. Music direction by Michael Gacetta. Scenic design by Nate Bertone. Lighting design by Dan Efros. Costume coordination by Paula Peasley-Ninestein. Sound design by Timothy Schmidt. Makeup design by Michael King. At North Shore Music Theatre through July 19. Nsmt.org.